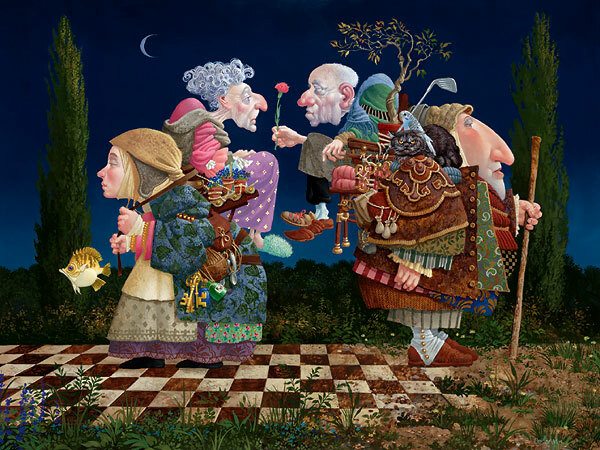 "This painting is a love story," says James Christensen. "Love on many different levels, but most importantly, the power of that which is everlasting. It is rich in symbols that suggest the close of a chapter; the twilight hour of day, the final phase of the moon, the turning leaves on an autumn tree and the checkerboard road that comes to an end. Even though this couple needs help in just getting around, they seem unconcerned. Despite the limitations of old age, they are supported by loved ones, surrounded by a lifetime of favorite things and they have each other. The carnation he offers her is a symbol of enduring love."